The bike handlebar, so simple only in appearance, can really help you to solve the driving problems of your bike by improving it. We often spend thousands of euros to change the bike; you change suspension and exhaust, you mount pieces in carbon, but then you forget the simpler things that really change the driving of the bike, improving it. - and above all, aesthetics are improved. Yes, because even if on the forums or in the facebook groups there is only talk of functional advantages, in reality many changes are made exclusively for aesthetic improvements. At the end you change the bike, to make it wonderful to drive, but also wonderful to see! Otherwise why spend so much money on putting ugly, anonymous and similar components to the original ones? The handlebar is no exception. Removing the steel handlebar and replacing it with an ergal SRT is not only practical because it reduces vibrations (SRT handlebars reduce vibration by up to 25%), but it is also nice to see, thanks to the brushed and anodized finish! Maybe you're thinking that your bike is going to be as good as it is, and we can not convince you of the opposite, because just trying an SRT handlebar will understand the benefits it will bring, improving the driving and the aesthetics of your bike. In fact, the feelings you will experience we can only describe them, but to live them you will have to try the SRT handlebar directly and enjoy the benefits of driving. 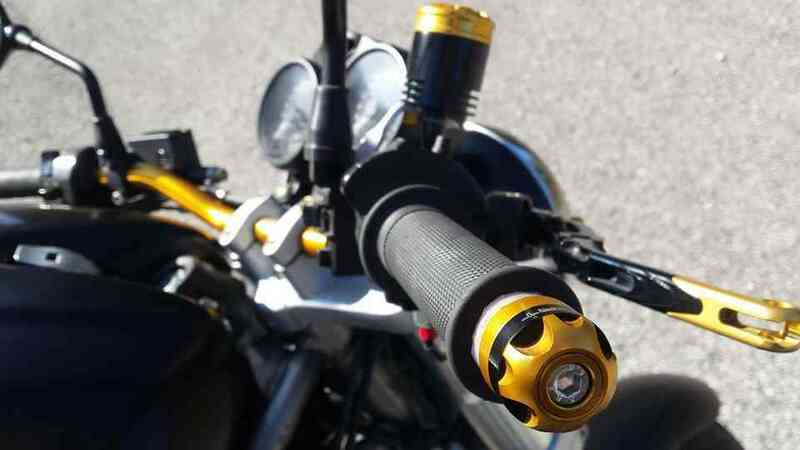 This applies to those who have a 22 mm handlebar as standard, such as the one mounted on most naked bikes, such as Ducati Monster 620/695/696, Honda Hornet, Kawasaki Z800, Z750, Z650, Suzuki GSR, Yamaha Fz8, Fz6, MT07, MT03, Triumph Street Triple etc. For those with a handlebar with a 28 mm variable section. And if your standard bike mounts a 22 handlebar you could make a great upgrade and go to the variable section, the handlebars that mount the most expensive and powerful naked (the naked 140/170 hp!). Have you ever wondered why high-performance motorcycles do not have 22 mm steel handlebars but are fitted with variable-section ergal handlebars? The builders on low-price entry level bikes are equipped with cheap components (including the handlebars) to keep the price low, but when you buy a 14 / 16.000 euro bike the standard mounted handlebar is almost always a variable section handlebar (some SRT series mountain handlebars). The choice of using the variable section ergal handlebar is due to the fact that the variable section handlebars improve comfort, reducing vibrations and improving the agility of the bike due to the lower flexibility of the handlebars and the more direct response. But the thing not to be underestimated is that they also improve the look of the bike, with a nice handlebar with variable section, the bike seems immediately more beautiful, more racing, more expensive, more aggressive, changes its appearance. You will never find a MV Agusta with a 22 mm handlebar or a Monster 1200 without a variable section handlebar. Whether your bike is used or new, if you want to improve it while driving and aesthetically, then changing the handlebars by choosing the SRT handlebars is the first thing to do. Did you know that a different handlebar can help you improve your driving? If you have already read some of our articles, you will have already seen that by mounting the SRT handlebars, you would have been able to change the driving style, improving it. But do you know why this happens? I am sure that you have already read our GUIDE and surely you will know by now by heart :). The SRT handlebars are designed to improve the handling of the bike, especially the naked Japanese who are fitted with very tight handlebars and with an unsuitable fold and also quite uncomfortable. But how can a handlebar improve the handling of the bike? 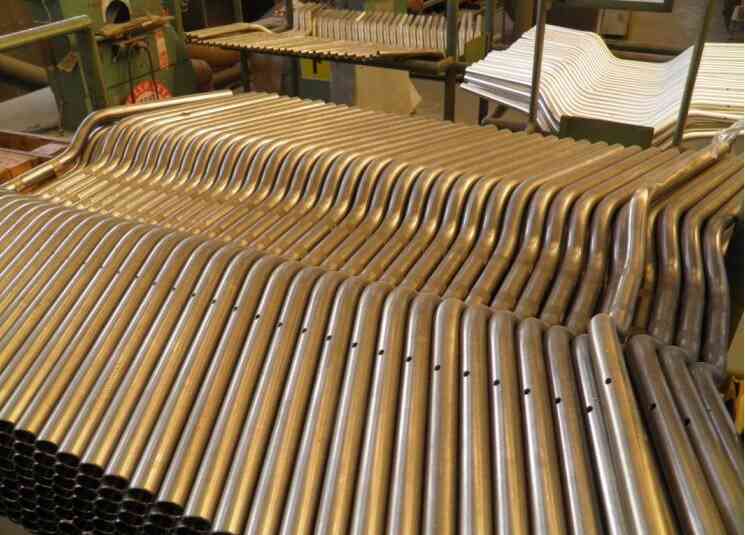 The SRT handlebars are designed and studied to improve the ride, the width and the type of fold are unique of our handlebars. In fact, it is not enough to take a low generic handlebars to find benefits, only the SRT low handlebar presents the right measures to improve the driving of your bike. For over 10 years our company has specialized in the production of motorcycle accessories, in particular in the manufacture of handlebars. Maybe you do not know SRT Factory and if you are interested you can deepen what we do (by clicking here) to improve the aesthetics, performance and driving of your bike. With our experience, particularly on the bike handlebars, we have created a line of handlebars with 3 different specific and patented folds, which fit perfectly to most of the bikes, improving aesthetics and driving. Our low fold and medium fold are born to improve the riding of the most common naked. Maybe you're thinking that the bikes are all different handlebars? We have verified it, taking the handlebars of the 10 most sold naked in Europe. The result that has emerged is that the handlebars of these motorcycles are all similar, and all present a major flaw. They are all extremely short and converging towards the pilot, forcing him to an uncomfortable position and penalizing the driving, moreover they are all made of steel, material that transmits a lot of vibrations. Starting from this base we have developed our BENDING HANDLEBAR and our FOLD MEDIA taking into consideration the driving posture. The same work was done to create our HIGHEST HANDLEBAR, obviously changing the type of motorcycle taken into consideration. Would you like to know in detail how our handlebars improve both the aesthetics of the bike, but above all the driving performance and agility? To help you better understand how a simple accessory such as the handlebar, which might seem trivial, can improve the driving of your bike, reduce vibration and make your bike look even more beautiful, removing the steel handlebar to replace it with an ergal one 7075, TUV approved, anodized and brushed, we have created the DEFINITIVE GUIDE ON THE HANDLEBAR to allow motorcyclists to better understand the advantages obtained by replacing it. This Guide is our gift for you! Apparently simple, the handlebars actually prove to be very important, both for safety and for driving (and not to forget the aesthetics, since it emerged from a marketing study, that 85% of motorcyclists buy a specific bike mainly for aesthetics). If you are undecided on the handlebars and the fold to choose from, or if you just have a few minutes to read, this free guide will help you in the future. I advise you to read it, it will help you choose the handlebar with more awareness and you will understand that the handlebar is not as trivial as it would seem. The SRT handlebar not only being wider and offering a superior lever improves driving, but above all our special bends, studied in over 10 years of tests dedicated to the improvement of our handlebars and thanks to the high quality material used, will allow you accordingly to give commands to the bike will be more direct and to clearly improve the feelings and the feeling of driving. Have you ever tried to push or slightly pull the handlebars of your bike while you're driving and you're on a straight? The bike will react by curving immediately, the greater the lever, the less this effort will be, obtaining a higher sensitivity result. In addition you can also improve your posture by choosing a handlebar that best suits your needs to drive the most comfortable bike, such as the high fold. Changing the handlebars is not just a matter of aesthetics, which will however improve by choosing a colored handlebar that stands out on the bike, or by choosing a handlebar made of ergal 7075 and anodized, you will also improve the quality of the bike and especially the driving. You do not have to have the handlebar wrong to justify its replacement of your handlebars, if you have not done yet we suggest you read our guide to understand how you can improve your bike by spending very little. Many times you do not replace the handlebar because you think that the original handlebar is fine, or many times you are worried that you do not mount. The answer is that you can only improve the aesthetics and driving of your bike by saving a lot of money in unnecessary changes! If you are afraid that changing the handlebars will overwhelm the driving of your bike, you do not have to worry. The handlebar does not change the driving characteristics of the bike, such as road holding, but improves and accentuates the sensitivity with which you will impress the driving controls. This means that you will not change any dynamic features, but simply accentuate their qualities, if your bike is agile it will become even more agile with the SRT handlebars. I am writing this because many people do not change the handlebars for fear of modifying something and making the situation worse, but the replacement of the handlebars will only bring improvements for the reasons I explained above. These fears arise from some changes to which every motorcyclist sooner or later is obliged to cope; such as changing tires once worn out. The change of tires is one of those changes that can bring positive or denied, even at the same level of tire (same price range but different brand), the fact of changing brand or model will cause a feeling and different feelings in the guide, sometimes positive sometimes negative, depending on how you are used to driving and other characteristics of the bike. Changing the handlebars is not like changing the tires, changing the handlebars with an SRT will simply accentuate the dynamics of the bike but it will remain unchanged. This means that you will only receive benefits by changing your handlebar with an SRT model, amplifying the qualities of your bike. If our handlebars are the most sold and required on the market is because the quality and care, but especially the years of experience that we have poured on this product are really appreciated by many motorcyclists. To better understand what we are talking about, I suggest you go read the product descriptions to understand that, besides the quality of course, you are buying unique products that solve driving problems and improve the look of your bike with maximum personalization. Our products are not cheap, the motorcyclists who buy our handlebars know that they are buying the best handlebars on the market, a premium handlebar of high level, safe, homologated, carefully finished, which will last over time, and that solves all problems driving, vibrating, improving the aesthetics of your bike. Our handlebars are exclusive, so if you're looking for 20 euro dumbbells you can find many online, but I warn you, worsen your bike with Chinese chopper is not the best, the cinesate as well as being dangerous and poor recognize themselves 1 km away, and they shout to the other bikers "I would like but I can not". Maybe some accessories china style you do not recognize them if you're inexperienced, but if you know the bike, recognize, for example, a fake Akrapovic exhaust or 4-foot platforms is a breeze. If you are looking for a product not only of very high quality, but also beautiful, exclusive, and with a recognized brand, then the SRT handlebars are for you.